The amazing, but under renovation, Mireuk-jeon and Bangdeung-gyedan shrine at Geumsansa Temple in Gimje, Jeollabuk-do. Geumsansa Temple, which means Golden Mountain Temple, in English, lies in a flat river valley on the western slope of Moaksan Provincial Park. It was first established in 599 A.D. or 600 A.D. (depending on the historic document that is being used). At that time, it was not a prominent temple like it is today. Then from 722 to 766, the temple was rebuilt and expanded under the watchful eye of master monk, Jinpyo. 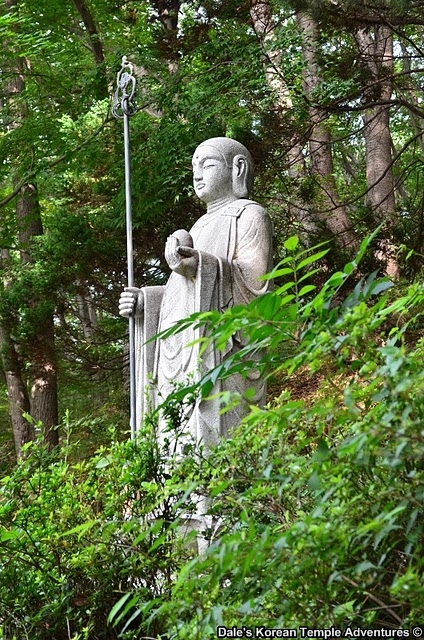 According to legend, Jinpyo had a vision of Mireuk-bul (The Future Buddha). In this dream he received a book on divination and 189 divination sticks from Mireuk-bul. As a result, a statue was made of Mireuk-bul and enshrined in the main hall. With this in mind, Geumsansa Temple became the headquarters for practicing Mireuk-bul worship during the Unified Silla Period. 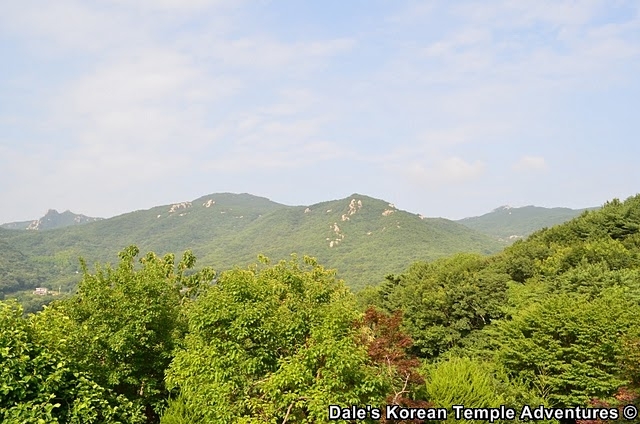 During the Imjin War in 1592, the temple acted as a training ground for monks in the defence of the Korean peninsula. Unfortunately, the entire temple and neighbouring hermitages were completely destroyed by the Japanese. Not long after, in 1635, the temple was rebuilt. Through these efforts, and subsequent ones, Geumsansa Temple is not only one of the largest in Korea; it’s also one of the most popular. 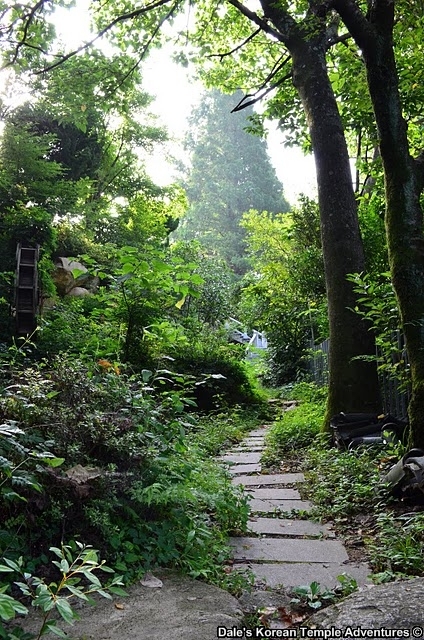 You first make your way towards the temple up a path that neighbours a frozen stream. You’ll then cross over a newly built bridge that has a dragon underneath. The first structure to greet you at the temple is the Haetalmun Gate, which houses statues of a youthful Bohyun-bosal (The Bodhisattva of Power) and Munsu-bosal (The Bodhisattva of Wisdom). They are joined by two guardians behind a screened-off area for their protection; however, this screen doesn’t allow for the best of pictures. This is also the problem with the large sized Cheonwangmun Gate. Even though the statues are tall and fierce in design, they also are blocked from a clear view because of the protective meshing that lies in front of them. 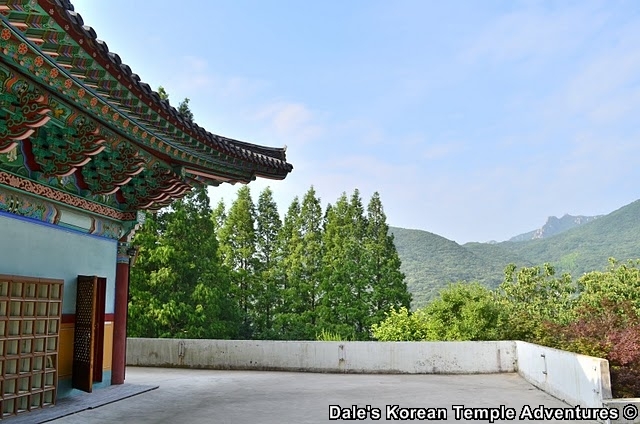 After passing through both gates, and under the Bojae-ru pavilion, you’ll enter into the expansive temple courtyard. To your immediate left is the temple’s rather large bell pavilion. And to your immediate right is the newer looking Gwaneeum-jeon. Housed inside this hall is a seated multi-armed statue of Gwanseeum-bosal (The Bodhisattva of Compassion). She wears a unique crown where two of her hands hold up an image of Amita-bul (The Buddha of the Western Paradise) over her head. Have a close look, it’s pretty special. Straight ahead lays the large and long main hall. Originally, it was National Treasure #476, until it burnt down in 1986. It was quickly rebuilt, and it currently houses 11 statues of Buddhas and Bodhisattvas along the main altar. The central image is Birojana-bul (The Buddha of Cosmic Energy). He’s joined to the right and left by Munsu-bosal (The Bodhisattva of Wisdom) and Bohyun-bosal (The Bodhisattva of Power). To the right of this triad stand four more statues. They are, in order, Nosana-bul (The Reward Body Buddha), Ilgwang-bosal (The Sun Bodhisattva), Yaksayore-bul (The Medicine Buddha), and Wolgwang-bosal (The Moon Bodhisattva). 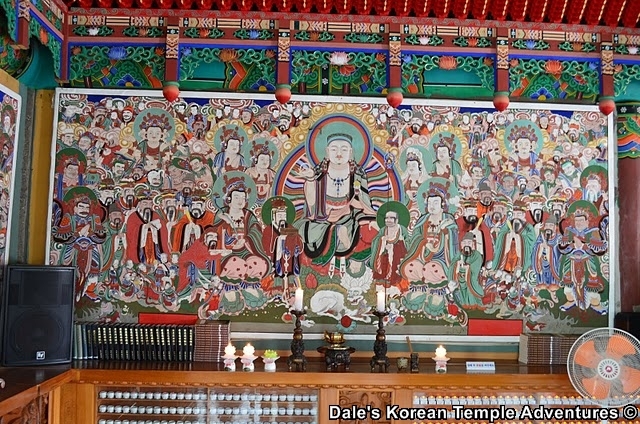 To the left of the central triad, in order, are Seokgamoni-bul (The Historical Buddha), Gwanseeum-bosal (The Bodhisattva of Compassion), Amita-bul (The Buddha of the Western Paradise), and Daesaeji-bosal (The Bodhisattva of Wisdom and Power for Amita-bul). As you can tell, this main hall is absolutely packed. Unfortunately, you can’t take pictures inside, and there’s a woman making sure you don’t. To the left of the main hall are two smaller sized shrine halls. The first is Daejang-jeon, which is dedicated to Mireuk-bul. 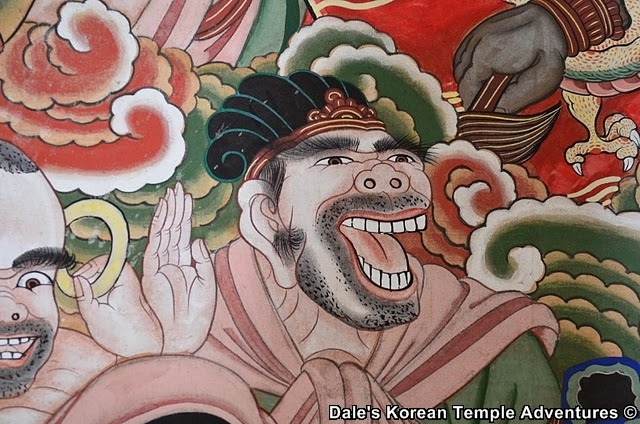 The outside walls are littered with monk paintings, while the interior is lined with Palsang-do murals, which record the life of Seokgamoni-bul. As for the main altar inside this hall, you’ll get to see one of the most beautiful renderings of Mireuk-bul. This Buddha statue is surrounded by an amazing fiery nimbus. To the right of this hall is the Myeongbu-jeon. Sitting on the main altar inside this hall is an older looking statue of Jijang-bosal (The Bodhisattva of the Afterlife). He’s surrounded on both sides by seated wooden statues of the Ten Kings of the Underworld. Just in front of this hall is the extremely unique stone carving called Noju. Its original purpose is no longer known. Just behind the main hall are three more temple halls. The first one to the far left is the large, but rather plain, Josa-jeon, which houses a row of paintings dedicated to former prominent monks at the temple. To its right is the highly elaborate, and well populated, Nahan-jeon. The triad sitting on the main altar is centred by Seokgamoni-bul, and he’s joined on either side by Mireuk-bul and Jihwakara-bul (The Past Buddha). These statues are joined by 16 Nahan on the main altar, who are in turn joined by 500 Nahan in the background. If you look close enough, you might even see a Nahan that looks like Arnold Schwarzenegger. Unfortunately, and like the main hall, the Nahan-jeon burned to the ground in 1986. Between these two halls lays the Samseong-gak shaman shrine hall. Out in front is an ugly gnarled tree with three older looking murals of Chilseong (The Seven Stars), Sanshin (The Mountain Spirit), and Dokseong (The Recluse) inside. Up a stone set of stairs that is situated next to the Nahan-jeon, you’ll come to the Bangdeung-gyedan. Housed in the centre of this stone shrine is a crowned stone lotus bud that formally housed five sari from Seokgamoni-bul. These sari are now housed in the Geumsansa Temple museum. In front of this stone lotus bud is a Goryeo Period five-story stone pagoda. The entire stone structure is surrounded by various, and descriptive, stone guardians. Just to the right is the Jeokmyeol-bogung. Like Tongdosa Temple’s main hall, this hall has no statues of the Buddha. Instead, the window inside this hall looks out onto the Bangdeung-gyedan and the Buddha’s remains. The final hall at Geumsansa Temple, and the most impressive, is the three-story wooden structure called the Mireuk-jeon. This hall is National Treasure #62, and it dates back to 1635. Housed inside this hall are three massive statues. The tallest, which stands nearly 12 meters in height, is dedicated to Mireuk-bul, who is the namesake of the hall. He’s joined on either side by two Bodhisattvas, Beophwarim-bosal and Daemyosang-bosal. Unfortunately, when I visited, this hall was under renovation. 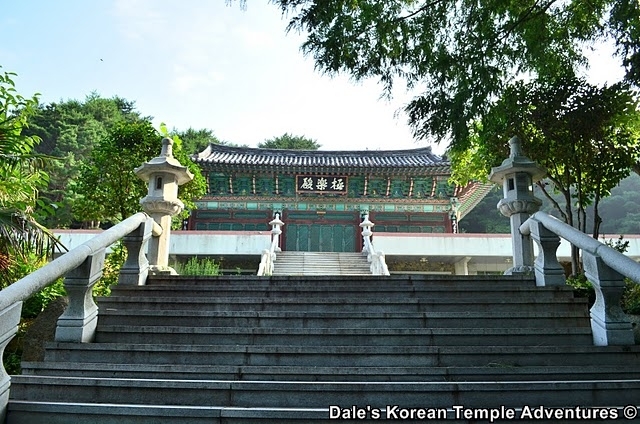 HOW TO GET THERE: To get to Geumsansa Temple, you’ll first need to get to the Jeonju Express Bus Terminal. 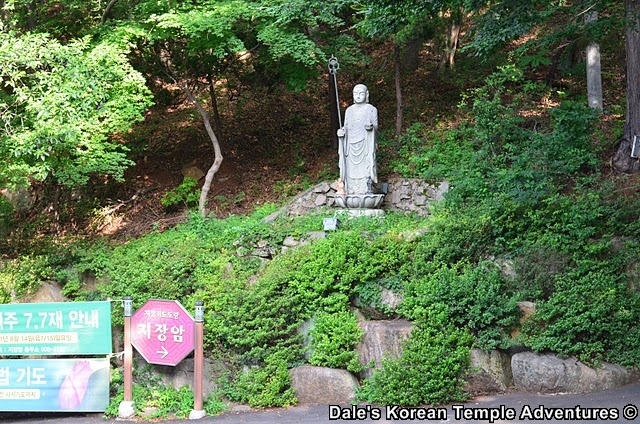 From there, take Bus #79 to Geumsansa Temple. The buses start leaving from the terminal at 6:24 in the morning, and they stop running at 22:45 at night. The buses leave every 25 minutes. Also, you can catch a bus from the Gimje Intercity Bus Terminal or Gimje Station. You’ll need to board Bus #5, which is a direct bus to Geumsansa Temple. OVERALL RATING: 10/10. What isn’t to love about Geumsansa Temple? The amazing Mireuk-jeon is something special, as is the massive main hall with the eleven statues of Buddhas and Bodhisattvas. Also, you can visit nearly a dozen halls at Geumsansa Temple. It’s no wonder this temple is so popular. In addition, the Bangdeung-gyedan, similar to the stone structure at Tongdosa Temple, which formally housed five sari from the Buddha, is something else that adds to Geumsansa Temple’s status as something special amongst temples throughout the Korean peninsula. As you can tell, I love this temple! The first view of Geumsansa Temple as you approach it from the pathway. The frozen stream that neighbours the pathway. The beautiful bridge that lets you into the temple grounds. The Haetalmun Gate that’s the first structure to greet you at the temple. The next is the Cheonwangmun Gate. One of the tall, but meshed off, Heavenly Kings. The Bojae-ru pavilion that blocks the view of the main temple courtyard. The bell pavilion to the left, as you first enter the temple grounds. The main hall, the Myeongbu-jeon, and the Daejang-jeon. A look inside the Daejang-jeon at the fiery Mireuk-bul statue. A look inside the Myeongbu-jeon at the green-haired Jijang-bosal. A closer look at the massive main hall with a well-populated interior. This hexagonal black stoned pagoda is National Treasure #27. A look at the Nahan-jeon on the right and the Josa-jeon on the left. With a Nahan statue of Arnie. The Samseong-gak that lies between both the Nahan-jeon and the Josa-jeon. The Sanshin painting inside the Samseong-gak. A look at the elevated Bangdeung-gyedan shrine that formally housed the Buddha’s remains. The Jeokmyeol-bogung Hall that looks out onto the stone shrine. The historic Mireuk-jeon hall that is unfortunately under renovation (unfortunate for me). A look up at the massive altar statues inside the Mireuk-jeon. The Gwaneeum-jeon under a winter sun. The unique multi-armed statue of Gwanseeum-bosal. The amazing Tapsa Temple in Jinan, Jeollabuk-do Province. The story of Tapsa Temple, which means Pagoda Temple, in English, begins with the enigmatic layman Lee Gap Yong (1860-1957). Lee Gap Yong first came to Mt. Maisan (Horse Ear Mountain) at the age of 25. For the next thirty years, Lee Gap Yong not only spent time meditating and enlightening himself, he single-handedly constructed some 108 spherical stone pagodas. He gathered the majority of rocks from the falling debris from the neighbouring mountain. Of this herculean task, some 80 pagodas still stand at Tapsa Temple. 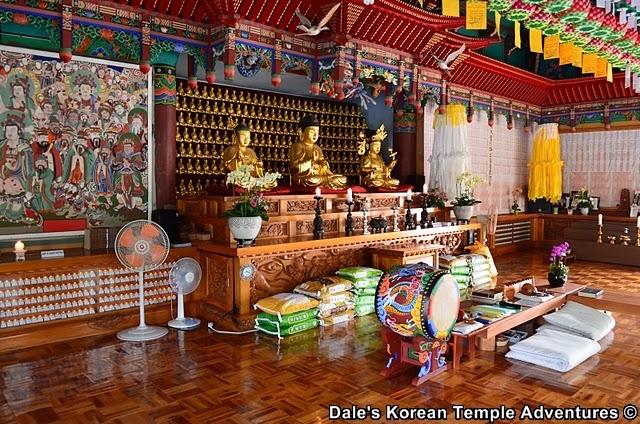 Much later in life, Lee Gap Yong became an ordained monk and the grounds became a temple. You first approach the temple up a 1.5 kilometre road that skirts the beautiful peaks of Mt. Maisan. Unfortunately, a fair bit of the road that leads up to the temple is occupied by gaudy tourist trappings of restaurants and knick-knack stores. When you finally do arrive at Tapsa Temple, it’s like you enter into another world. The landscape of Tapsa Temple is almost like you’ve landed on the moon. Small and large spires stick out from the stony landscape. These pagodas look fragile in design; and yet, they’ve lasted over 100 years. Standing in front of this bizarre landscape, you’ll notice a bronze statue of Lee Gap Yong inside an artificial cave. To the far right is the temple’s bell pavilion. As you make your way up the mountainous trail, heading towards the main hall, you’ll get an amazing view of the surrealistic landscape. Perched above the pagoda laden landscape is the diminutive main hall. All but unadorned on the exterior, the colorful interior of the main hall more than makes up for this deficiency. Sitting on the main altar sits a triad of statues centred by Seokgamoni-bul (The Historical Buddha). Flanking this statue, both to the left and right, are Jijang-bosal (The Bodhisattva of the Afterlife) and Gwanseeum-bosal (The Bodhisattva of Compassion). To the left of the main altar is a Chilseong (The Seven Stars) mural. And on the far left wall is a picture of Lee Gap Yong and Gwanseeum-bosal. To the right of the main altar is a guardian mural. Behind the main hall, and perhaps one of the most original interiors in all of Korea, is the Sanshin-gak. Sitting to the centre right is a statue of Sanshin (The Mountain Spirit). To the centre left is a life-size statue of Lee Gap Yong in older age. The painting of Sanshin inside this hall has a triad of images. In the centre is the standard image of Sanshin, while to the right is a female representation of Sanshin. And amazingly, to the left is Lee Gap Yong with a set of stone pagodas at Tapsa Temple. Above both of these halls are perhaps two of Tapsa Temple’s most famous collection of pagodas: Cheonji-tap and Obong-tap. To the left of the main hall, and down the side of the mountain trail, are two statues. The first is a beautiful granite statue of Gwanseeum-bosal, while the second is a stoic-looking Mireuk-bul (The Future Buddha). The final hall inside the temple grounds is the Yeongshin-gak hall. Inside this smaller sized hall sit three statues and paintings on the main altar. The first that sits in the centre is a crossed-eyed Seokgamoni-bul. To the right sits Gwanseeum-bosal with what looks to be Lee Gap Yong inside the painting that backs this statue. The final statue that sits on the altar, and to the far left, is Jijang-bosal. Backing this statue is an equally original painting of the Tapsa Temple grounds. The entire temple grounds are really something so different from anything I’ve ever seen at a Korean temple. 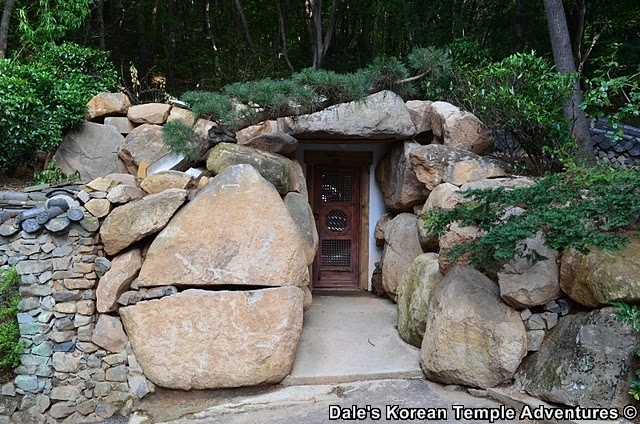 This temple goes a long way in counteracting all those arguments that say all Korean temples look the same. At every angle, you’ll see an all new pagoda or statue buried in the pock-marked landscape of Maisan Provincial Park. Admission to the temple is 2,000 won. And if you bring a car, the parking fee is 2,000 won, as well. HOW TO GET THERE: First, you’ll need to get to Jinan Bus Terminal from wherever it is you live in Korea. From the bus terminal, you’ll need to take a bus bound for Maisan Provincial Park. These buses leave every 40 minutes and start at 7:30 in morning and run until 18:00. Once you’re dropped off at the entry to Maisan Provincial Park, you’ll need to walk up the 1.5 kilometre road to Tapsa Temple. The 15 to 20 minute walk is a beautiful hike with the peaks of Mt. Maisan off in the distance. OVERALL RATING: 9/10. While the road that leads up to the temple is poorly managed with over-commercialized restaurants, stores, and what-nots, the temple itself more than makes up for any short-comings. The other-worldly landscape is adorned with 80 stone pagodas and beautiful temple buildings. This temple is truly an original. 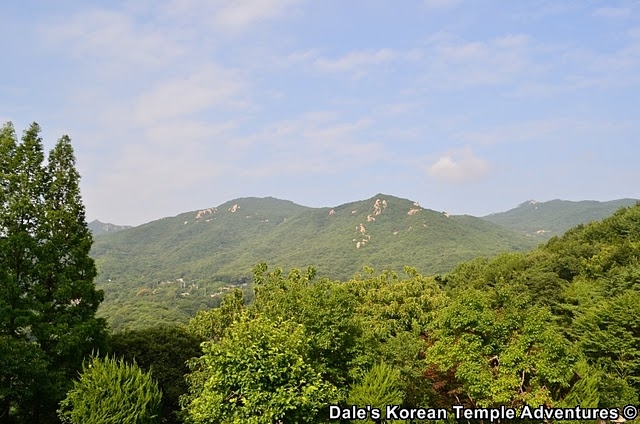 And any visitor to Korea should make their way out to Jeollabuk-do Province to have a look at the amazing Tapsa Temple. The road that leads up Tapsa Temple. The beautiful view of Mt. Maisan. The pock-marked peaks of Mt. Maisan. A better look at the surreal landscape. The first view of the entire Tapsa Temple grounds. The beautiful bronze bell at Tapsa Temple. The bronze statue of Lee Gap Yong inside an artificial cave at the base of the mountain. The bizarre landscape at Tapsa Temple with some of the 80 pagodas that dot it. The main hall with the pair of Cheonji-tap pagodas above it. Inside the main hall with the altar statues to the right and the pictures of Lee Gap Yong to the left. The Sanshin-gak behind the main hall. The altar pieces and painting inside the Sanshin-gak. The view from the main hall down at the temple buildings and statues below. One of the highly-original pagodas at Tapsa Temple. The beautiful statue of Gwanseeum-bosal. The view from the Gwanseeum-bosal statue. Simply amazing! The stoic statue of Mireuk-bul. The Yeongshin-gak, which is the third temple hall, at Tapsa Temple. The statue of Jijang-bosal with a painting of Tapsa Temple behind him. A look up at the surreal landscape. A statue of Lee Gap Yong with the moon-like landscape all around him. One last look up at one of the most original temples in all of Korea. 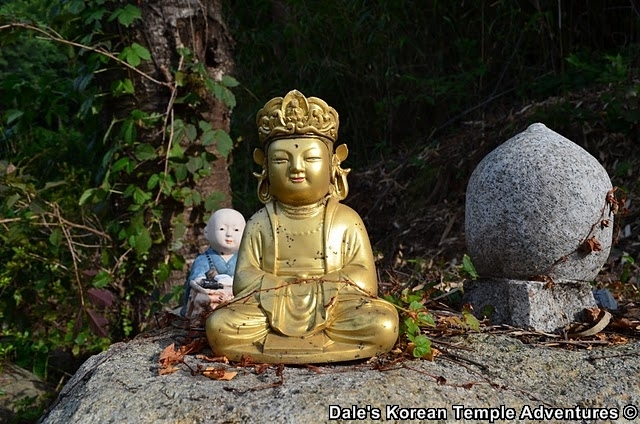 The statue of Jijang-bosal that greets you at Jijangam Hermitage, near Beomeosa Temple, in Busan. 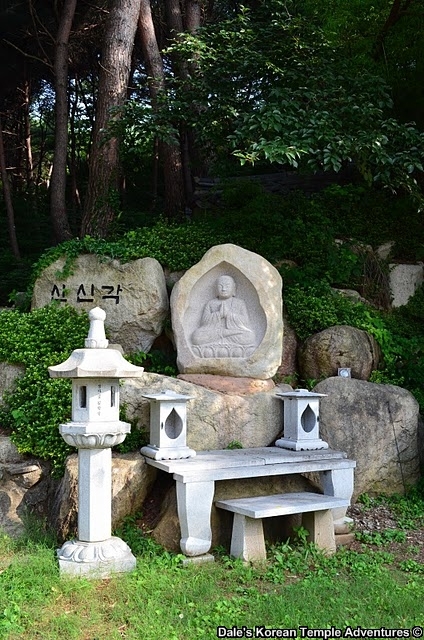 Jijangam Hermitage (지장암) is a hermitage dedicated, and named after, the Bodhisattva Jijang-bosal. Jijang-bosal is the Bodhisattva of the Afterlife. He can be identified by his bald or closely cropped hair that is green, black or gold. In his hands he holds a staff in his right hand and a pearl in his left. The pearl is a “wish-fulfilling pearl” that grants selfless wishes, while the staff opens the gates of hell. When you first approach the hermitage from the uphill, side-winding, road, you’ll notice both a sign that reads – 지장암 – as well as a five foot tall stone sculpture of Jijang-bosal to your right. You can get to the hermitage in one of two ways: you can either take the newly constructed road to the left, or you can take the path that leads to the left through the overgrown trees and shrubs. Originally, the path to the left was intended as the way to approach the hermitage, so that’s the way my wife and I decided to travel. Up a set of overgrown trees and shrubs, as though nature were collecting back what was rightfully Hers, we spotted a pond that hadn’t been used in quite some time. Up another set of stairs, we were finally eye to eye with the main hall at the hermitage. Finally, up one more set of stairs and we were in the main courtyard at the hermitage. Facing the main hall, we noticed that there was the monks’ dorms to the left, while the nicely sized main hall was directly in front of us. 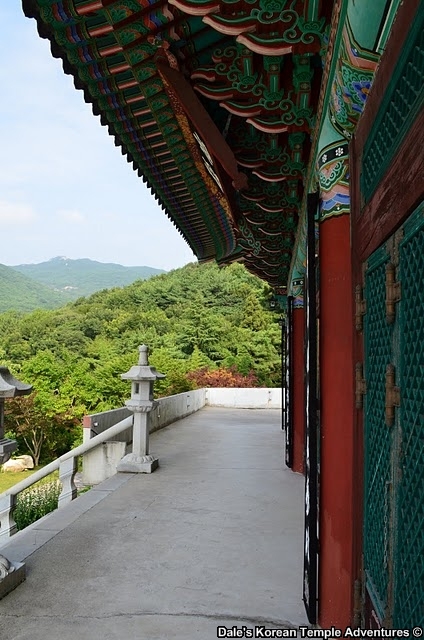 The main hall itself has very little exterior decoration adorning it, other than being customarily painted the standard Korean temple colours. However, the views of the surrounding mountains, Mt. Geumjeongsan, were beautiful. And inside the temple, there were a couple highlights to the trip to the hermitage. There was a beautiful guardian painting, as well as a beautiful painting of Jijang-bosal, both of which have countless Buddhas, Bodhisattvas, and guardians. The triad on the altar is Amita-bul (The Buddha of the Western Paradise) in the centre, with Jijang-bosal (The Bodhisattva of the Afterlife), and the namesake of the hermitage, to the left, and Gwanseeum-bosal (The Bodhisattva of Compassion) to the right. When leaving the temple, down the newly constructed road, there was a beautiful shrine with a statue of Buddha. Also, there was a uniquely designed meditation hall built as a hut into the side of the mountain. HOW TO GET THERE: You can get to Jijangam Hermitage in one of two ways. In both scenarios you first have to take the Busan subway, line one, to Beomeosa station and take exit #1. Here, you can either walk halfway up the thirty minute hike to Beomeosa Temple, or you can walk a block uphill to the bus stop where you can take bus #90 to the nearby entrance of the hermitage. You’ll probably overshoot the hermitage, and have to make your way back down the hill a bit, but as long as you have a keen eye you’ll be able to spot the hermitage. After visiting the hermitage, you can either walk the remaining 15 minutes up to Beomeosa Temple, or you can find your way back to the bus stop. OVERALL RATING: 3/10. While not the most amazing or inspiring hermitage you’ll see in Korea, the hermitage does have a few highlights. The beautiful views from the main hall of the surrounding Mt. Geumjeongsan is certainly one of them. Another is the beautiful guardian painting, as well as the Jijang-bosal painting, both of which are on the left side of the main hall. There is also a uniquely built meditation hut for the monks at the hermitage on the newly constructed hermitage road. Finally, there is a beautiful sculpture of Jijang-bosal at the entrance of the hermitage. 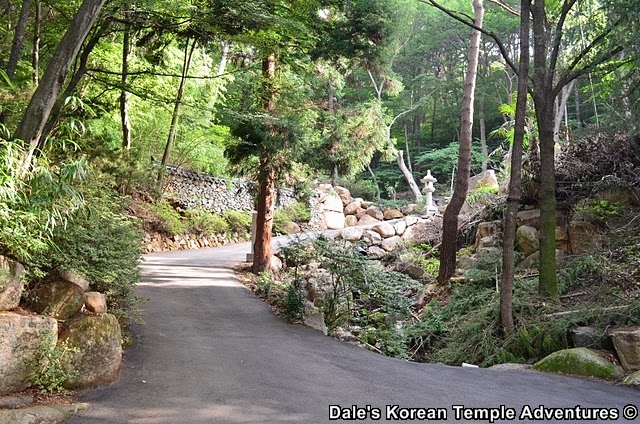 While I probably wouldn’t get off the bus that heads up to Beomeosa Temple, I would stop by if I was making the thirty minute hike uphill to the famous Busan temple. It makes for a nice little break at the half-way point, and what better way to take a rest than to have a look at a nice hermitage along the way. The sign and the statue that welcome you to Jijangam Hermitage. The newly paved road that leads up to the left of the hermitage. And the overgrown path that leads right to the hermitage. The set of stairs that leads up to the main hall and the hermitage courtyard. A view from the main hall at the surrounding mountains. Another view of the craggy rocks that make up the surrounding Mt. Geumjeongsan. The altar inside the main hall. In the middle is Amita-bul (The Buddha of the Western Paradise), to the left is Jijang-bosal (The Bodhisattva of the Afterlife), and to the right is Gwanseeum-bosal (The Bodhisattva of Compassion). 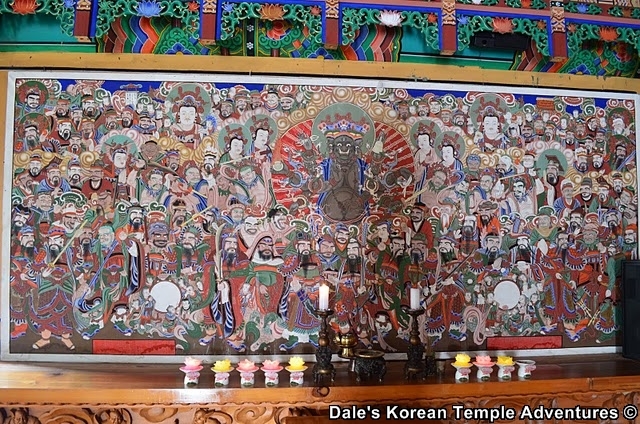 To the left of the altar is this mural dedicated to Jijang-bosal. And on the far left wall is the guardian painting. Here is a better look at one of the open-mouthed individuals on the guardian mural. The beautiful little shrine to the left of the main hall. One of the little Buddha figures beside the shrine. The meditative hut for monks at the hermitage. And one last look at the Jijang-bosal statue at the hermitage that both welcomes you and says good-bye.